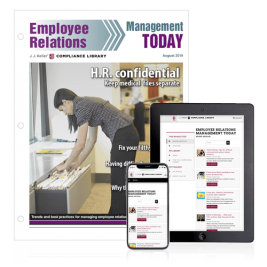 Employee relations newsletter provides HR pros with expert insight and advice to strengthen and reinforce supervisors' employee management skills. Your A to Z guide to employment law compliance. Covers more than 100 vital HR topics, including FMLA, ADA, HIPAA, FLSA, COBRA and more. Also includes state coverage of 51 key topics.